where . Note that is a function of the function . In mathematics, a function of a function is termed a functional. Figure: Different paths between points and . The meaning of the previous equation is that if , where is small, then the first-order variation in , denoted , vanishes. In other words, . The particular function for which obviously yields an extremum of (i.e., either a maximum or a minimum). Hopefully, in the case under consideration, it yields a minimum of . This equation must be satisfied for all possible small perturbations . This condition is known as the Euler-Lagrange equation. Of course, is the equation of a straight-line. 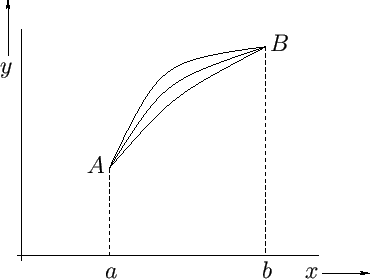 Thus, the shortest distance between two fixed points in a plane is indeed a straight-line.